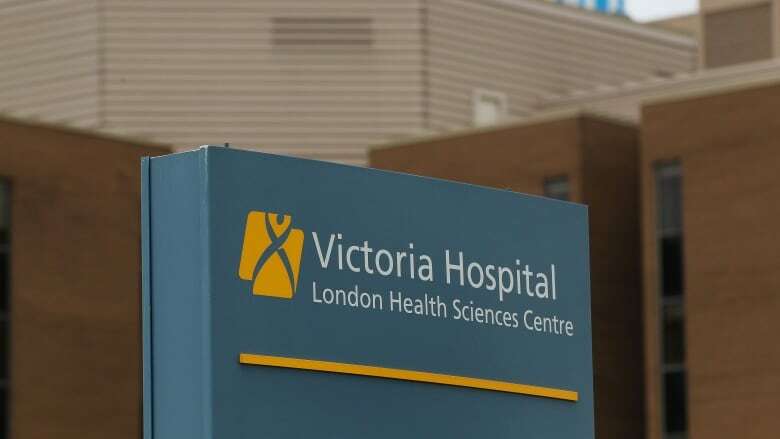 Documents obtained by CBC News shows hospital beds at London Health Science Centre were occupied by patients who no longer needed treatment for a total of 108,688 days between 2014 and 2017. As London's emergency rooms stand on the cusp of being swamped by another busy flu and winter fracture season, new numbers obtained by CBC News are giving us an idea of the state of hospital gridlock within London's largest healthcare facility. 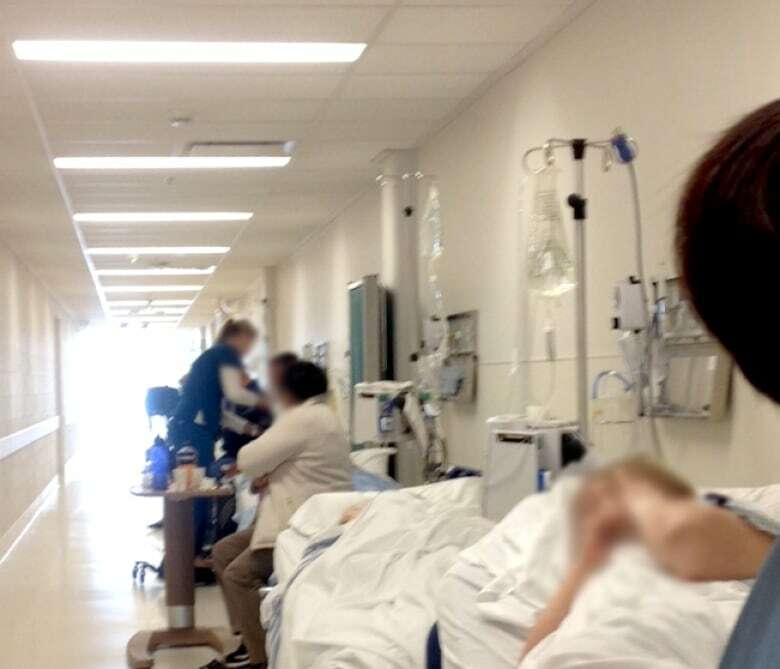 So-called "bed blockers," people who occupy a hospital bed where they no longer require treatment but can't be released from hospital, have eaten up 298 years worth of bed time at London Health Science Centre over a period of four years. The numbers, obtained through a freedom of information request, offer a snap shot of how LHSC struggles to cope with "alternate level of care" (ALC) patients, the health system's official label for people who are sometimes referred to colloquially as "bed blockers." Many of the patients are vulnerable, often elderly and suffer from cognitive disorders such as dementia as they wait for space in a nursing home or home care. The numbers reveal that from 2014 to 2017, LHSC discharged a total of 5,569 ALC patients, who spent a combined 108,688 days occupying hospital beds. That's roughly 298 years. In 2016 alone, the hospital discharged 1,512 ALC patients, who spent a combined total of 31,677 days occupying hospital beds reserved for the type of care they didn't need. The worst case at LHSC saw a patient marooned at the hospital for a total of 929 days, or almost two and a half years, before being discharged to a nursing home in 2015. That's 140 times the average hospital stay at LHSC, which is 6.6 days, according to its own data. 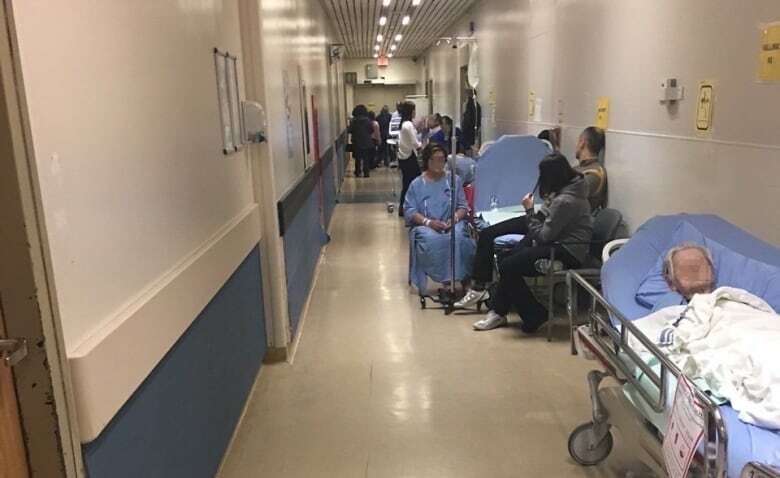 LHSC has been dealing with problems of overcrowding, which has forced the hospital to set up wards in hallways in order to deal with patients who need beds, but have nowhere else to go. While the numbers might seem surprising to those outside the healthcare field, they're no surprise to Vicki McKenna, a veteran nurse who worked for years at LHSC and is now the president of the Ontario Nurses Association. "It's astounding to think about it, but it's become our reality, unfortunately," she said. McKenna said years of cuts by successive provincial governments have forced hospitals to pare down costs on staff, equipment and facilities, which has reduced the number of beds available and the number of staff to treat patients. "Some of the funding decisions and cuts have been catastrophic in many instances." In 2016, LHSC closed its 15-bed transitional care unit, a place where patients with no place to go would end up when they were waiting for appropriate care to open up. The reason it closed, according to LHSC, is because the provincial government ended the $1.7 million in funding required to keep it open. "We are making-do in makeshift situations in our hospitals and other facilities to try and make-do and it's not good enough," McKenna said. "There isn't enough money in our hospitals for what our reality is today." "In order to build capacity, it's an investment," she said. "The back side of that, the hospitals are trying to cope with the volumes they (have), with not enough money and you must be within budget." On top of hospitals being short on money, Graham Webb, a lawyer and the executive director for the Advocacy Centre for the Elderly, said Ontario is also facing a demographic crunch, where the aging population outstrips the system's ability to properly accommodate their needs. "We don't have enough appropriate long term care home beds," Webb said. "That's creating a backlog in hospitals where patients needing long-term care really have no where else to go." "I don't think it's always been like this. I've been with the Advocacy Centre for the Elderly for the last 23 years and certainly it's always been the case there have been patients waiting in hospital for admission to long term care homes, but never at the proportion we're seen now," he said. The shortage of beds has regularly been making headlines. From a man almost marooned in Mexico because there was no room at London hospitals, to a woman languishing in a St Thomas hospital for three years, to a 50-year married separated by hospital administrators trying to free up space, even reports of staff being "taxed" because of overcrowded conditions. 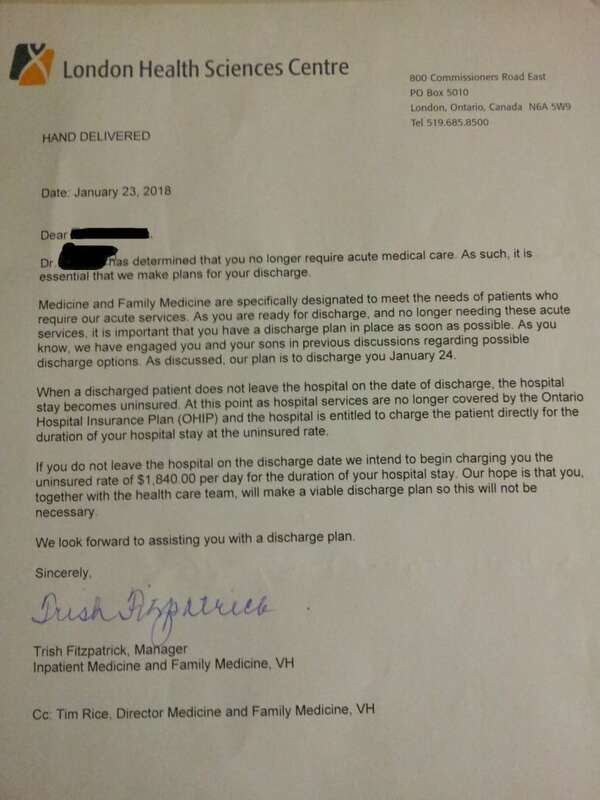 The pressure on hospital administrators to relieve overcrowding has forced healthcare providers such as LHSC to resort to intimidation tactics, such as sending patient letters threatening to charge the full cost of a hospital bed, up to $1,840 per day, in order to get patients who sometimes require some form of healthcare, to leave. It's something lawyers like Webb are starting to see more often and he argues the threats are outside of what the law actually allows hospitals to do. "These exorbitant fees are outside their regulations and we think they're without legal authority," he said, noting that patients who are inappropriately asked to leave should refuse. "They should not buckle under to pressure for an inappropriate discharge placement," he said. "They should really be saying ,'No we're not accepting that' because if it's a substitute decision under the Healthcare Consent Act, it is not the right decision to agree to a placement that doesn't meet the patient's care needs." "Our top priority at all times is always the health and well-being of our patients," LHSC vice-president Julie Trpovski said in a written statement to CBC News Friday. 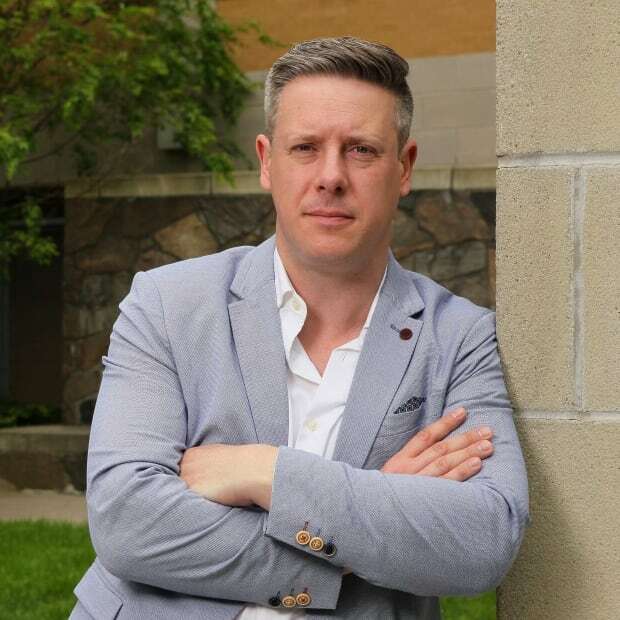 "Like many hospital across the province, London Health Sciences Centre experiences surges in the number of patients that have been designated Alternate Level of Care (ALC)." "We are pleased to note that, as evidenced by our reportable data, we have been successfully reducing the total number of ALC days year-over-year since 2016," she wrote. "Surges" however are unpredictable and with flu season already here, the numbers could easily change. In the first seven months of 2018, LHSC has discharged a total of 621 ALC patients, who occupied hospital beds in units where they no longer required care for 13,253 days. If the year continues at its current pace, LHSC will be on par to a similar year as 2017. Ontario's $19 billion healthcare system has 20,000 acute care beds across the province. The government estimates that as many as 15 per cent of them are occupied by patients who no longer require care, but still have nowhere else to go. Last month, Premier Doug Ford claimed to have ended "hallway medicine once and for all in this province" when his Progressive Conservative government announced $90 million to help ease hospital gridlock across the province and open up 1,100 "new" beds. It's a nearly identical announcement made by the previous Liberal government in 2017, when it pledged $100 million to help open up 1,200 "new" beds to ease overcrowding in hospitals during the busy flu season. During the provincial election campaign, Ford pledged to create 6,000 new long-term care beds over the next five years in order to build capacity in the province.